The Mercury of December 28th, 2018, published an article by Thillay Naidoo in which he blames Islam for the problems facing the hapless Kashmiri people. Kashmir has been an independent Nation-State for over 5000 years. India insists that Kashmir is part of India and its constitution. Kashmir was never part of India. In 1947, at the time of Partition, Kashmir was overwhelmingly Muslim, with Pandits, Buddhists, and Sikhs featured as welcome religious minorities. Unfortunately, the Hindu Ruler, Maharaja Singh, was a tyrannical ruler who handed over Kashmir to India, claiming that the “Instrument of Accession” would prove it. To this day that “Instrument” has never been produced. The then Prime Minister of India, Pandit Nehru, had voiced a consensus view that sovereignty in princely states like Kashmir had devolved on their respective peoples as of August 15; and, that the peoples’ voice should prevail in a plebiscite over the sovereignty ambitions of ruling maharajas in cases of conflict. In two predominantly Hindu princely states (Junagarh and Hyderabad) where the rulers were Muslim, Nehru enforced his view by flexing India’s military muscles. In Kashmir, Nehru initially championed a plebiscite to determine its sovereign destiny. Accordingly, India sponsored plebiscite resolutions before the United Nations Security Council, which were adopted in 1948 & 1949. But Prime Minister Nehru and his successors reneged on their international law obligation when they realized Kashmir would never vote accession to India in a free and fair election. That explains India’s stubborn resistance to implementing the U.N. Security Council’s plebiscite resolution which India itself sponsored. However, a commanding majority of Kashmiris desire freedom, democracy, the rule of law, religious pluralism and above all, Peace. India refuses to say that Kashmir was invaded and annexed in 1947 with the help of Maharaja Singh. India uses “terrorism” as a pretext to terrorize the local communities. Kashmiris are victims of the ill-defined term “terrorism”. In fact much of the cross fires across the Line of Control (LoC) is used solely for this purpose. India kills Kashmiris as part of its sadistic strategy to silence them for seeking a sovereign, independent state. Over 1 million Kashmiris have been killed by the paid Indian Occupation forces, whose thirst for Kashmiri blood remains unquenched. Since 9/11 the Indian Government has decided that the Kashmiri resistance to the occupation is an act of “terror””. This interpretation gives the Indian occupying army permission to act with total impunity. The Armed Forces Special Powers Act (AFSP Act) has ensured that the security and military forces will not be held accountable for any human rights violations against the people of Kashmir. 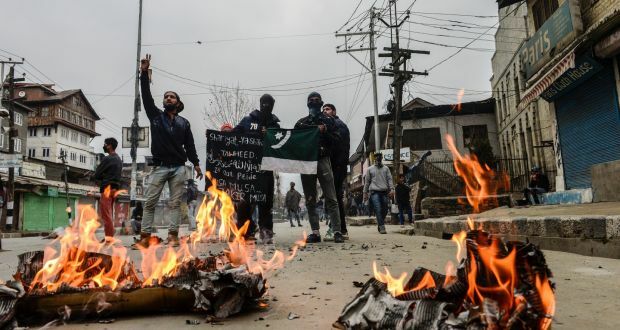 The crisis in Kashmir has absolutely nothing to do with Islam.